I hope you don’t mind if I occasionally re-cycle Facel material that I’ve found elsewhere. One constant source of Facel information is the French site mentioned in the links menu and this is where I found news of an HK500 being restored by Pitt Lane Restorations at Winchester which is around 30 miles from me! As you can read, this is an LHD car, chassis number E3 which originally went to the well known car agent Becker in Germany, thence to the USA, again to a German, again to the USA and then purchased by FVCC member Michael Culhane, who has started the restoration. It was known to be in storage near Heathrow for many years but I didn’t know that at some stage it had been fitted with an Opel 6-cylinder engine and manual gearbox. Mr Culhane intends to fit it with a Chrysler V8 and a Torqueflite automatic gearbox, as per its original specification. 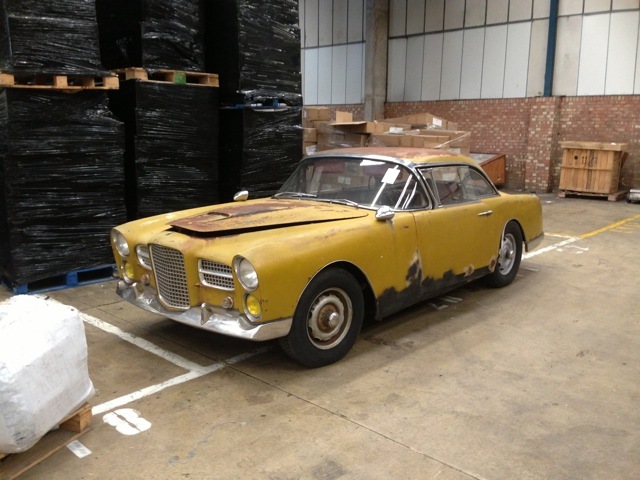 Anyway, you can read more about its restoration here http://pittlane.co.uk/facel-vega-hk500-restoration/ and I would suggest that when it’s finished it will be for sale, so you might want to make contact with the restorer nice and early. There’s lots of detail about the restoration, so I don’t feel that I need to add any more. Incidentally, I am going to Australia in the next few days, so it might go quiet again on this site, but I am meeting up with former Facel owner and Australian classic car guru Paul Blank later in the week, so hopefully we’ll have some more Facel news then. One of my tasks on the flying machine is to scour this month’s Classic and SportsCar magazine for Facel mentions – apart from the Retromobile auction results which I know we have covered extensively.